John Wynne is an award-winning sound artist whose practice includes installations and ‘composed documentaries’ for radio which hover on the boundary between documentation and abstraction. His massive installation for 300 speakers, player piano and vacuum cleaner became the first piece of sound art in the Saatchi collection in 2009 and won him the 2010 British Composer Award for Sonic Art. His work with endangered languages includes a project with click languages in the Kalahari and another with one of Canada’s indigenous languages, Gitxsanimaax. His work with heart and lung transplant patients in collaboration with photographer Tim Wainwright led to a book, a 24-channel installation and a half-hour commission for BBC Radio. His first venture into theatre sound design was for Scottish director Graham McClaren’s edgy 2011 production of Andromache in Toronto. John is a Research Fellow at the University of the Arts London and has a PhD from Goldsmiths College, University of London. Denise Hawrysio was born in Toronto and currently lives in London, UK. She received her BFA from Queen’s University, Canada, and her MFA from the San Francisco Art Institute. She works in a variety of media including print and site-specific installation and has exhibited her work throughout Europe, the United States and Canada. In 2006 she curated and participated in the group exhibition 15/1 (3) at Overgaden Institute for Samtidskunst and in 2004 had a solo exhibition at RACA in Copenhagen. She done artist residencies at the University of British Columbia (UBC) in Vancouver, the University of Alberta and the MacDowell Colony in the US and has taught at UBC, the Architectural Association of Great Britain, the University of Central Lancashire and the University of the Arts London. This recording captures sounds from a kinetic sound installation consisting of “flying radios” – small radio receivers housed in electronic flapping winged-devices (ornihopters) suspended from the ceiling with wire, that flew in circular patterns around the room. The radios play a set of Shepard Tones – an auditory illusion that gives the impression of a tone continuously rising in pitch – sent to the radios via FM transmitters attached to 2 of the 40 boom boxes that were located in an adjoining room housing the second part of the installation. 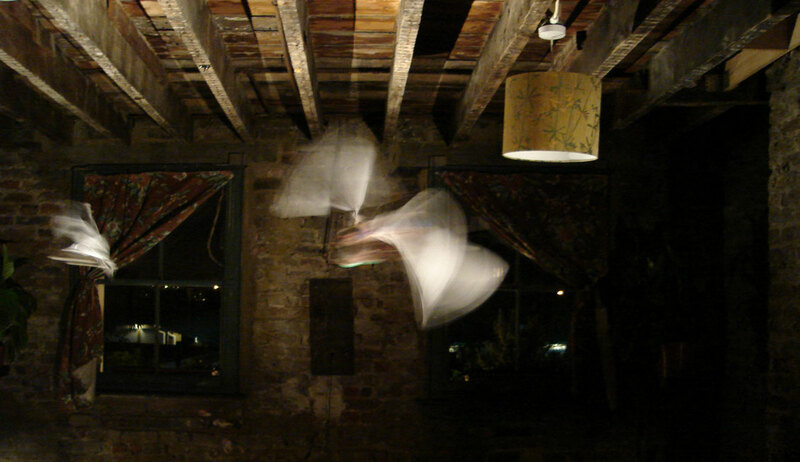 John writes that “The flying radios are inspired by the pigeons which no doubt inhabited Wilton’s Music Hall during its years of dereliction”. Of all the wax cylinder recordings made so far, this was probably the most experimental in as much as we had no idea if the horn would capture any sound at all, due to the difficulty of positioning the phonograph and the low amplitude of the radios. However, a faint Shepard Tone was indeed registered; the pulses one hears are the very points at which the radio briefly passes the mouth of the horn, placed as closely as possible to the flying object, although the sounds of the flapping wings are much harder to discern.